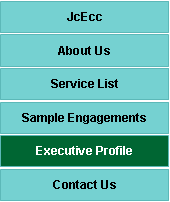 JcEvers Consulting Corp brings skill and flexibility to your organization. Consulting Principal, Joseph C. Evers. North America as well as Asia and Europe. and monitoring project governance processes. · Professional Services Advisor: Engaged by a small Canadian Healthcare systems consultancy that was experiencing stagnate growth. Reviewed pursuit approach and management structures, participated in pursuits and developed pragmatic recommendations for change. Provided professional coaching to the two founders. As a result of the changes and increased sales & margin, the firm was acquired within eighteen months by a large multinational consulting firm. · National PeopleSoft Leader: 65 person team. Leading the team through market development, solution definition and project delivery. Achieving 50% growth during challenging market conditions. · Regional Director of Operations: Client and P&L responsibilities for Southwestern Ontario Consulting practice. 25 person team delivering a diverse list of consulting services to the mid-market. · Regional SAP Practice Leader: Client and practice responsibility for a 30 person SAP practice. Led the business case and subsequent implementation of a Canadian Centre of Excellence delivering off-site SAP technical development and configuration for North American SAP clients. · IT Process Advisor: Engaged by a large American Not-for-Profit organization to develop a structured IT Project Approval Framework that took into account user, IT, consulting and financial resource availability. Introduced a simplified project abstract and business case template that maintained management engagement without losing important project governance foundation. The framework had to account for diverse stakeholder values — those driven by financial ROI and a community services view based on qualitative values. To expand the services to client organization, Joe identified Associates with whom he has worked in the past.